Norfolk & Western 2-6-6-4 No. 1218 is back in retirement and Union Pacific's 4-6-6-4 "Challenger" No. 3985 runs less frequently now. The days of being able to view a couple of America's huge articulated locomotives is not what it was. But the experience of watching these great "double engines" is yours again and again in this comprehensive 82 minute video. This program highlights the break-in runs of both locomotives following restoration in the 1980's. Then you'll see some outstanding scenes of these big engines in action! For example, you'll see the Challenger pull a 143 car American President Lines "stack train" up Archer Hill at track speed! Talk about horsepower! You'll also see double and triple-headers with the N&W's No. 1218. 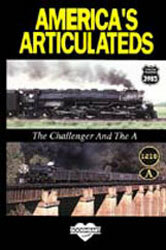 Enjoy cab rides, pacing scenes and plenty of track side runbys in this study of uniquely American steam power.